The question of how China will relate to a globalising world is one of the key issues in contemporary international relations and scholarship on China, yet the angle of innovation has not been properly addressed within the field. 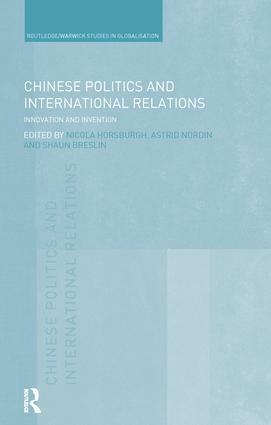 This book explores innovation in China from an International Relations perspective in terms of four areas: foreign and security policy, international relations theory, soft power/image management, and resistance. Under the complex condition of globalisation, innovation becomes a particularly useful analytical concept because it is well suited to capturing the hybridity of actors and processes under globalisation. By adopting this theme, studies not only reveal a China struggling to make the future through innovation, but also call attention to how China itself is made in the process. Part 1 focuses on conceptual innovation in China’s foreign and security policies since 1949. Part 2 explores theoretical innovation in terms of a potential Chinese school of International Relations Theory. Part 3 expands on innovation in terms of image management, a form of soft power, in particular how China exports its image both to a domestic and foreign audience. Part 4 highlights how innovation is used in China by grassroot popular groups to resist official narratives. This book will be of interest to students and scholars of Chinese studies, Chinese foreign policy and international relations, international relations theory and East Asian security.